Everyone's favorite pirate is brilliantly captured in three dimensions in the latest Cinemaquette release! Captain Jack Sparrow stands defiant, ready to take on the world, or at least pick its pocket and sneak out the back door! 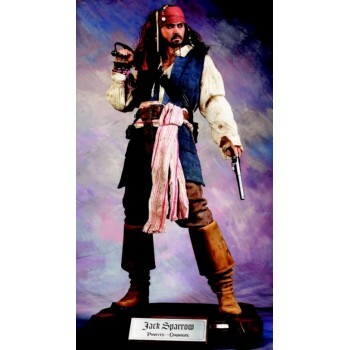 Constructed of polyurethane composite with realistic silicon skin, the Captain Jack Sparrow Cinemaquette's head is individually punched with real human hair, and features film-accurate clothing and weapons, authentic in every detail. And every Captain Jack Cinemaquette includes a Certificate of Authenticity signed by actor Johnny Depp, signifying his approval of the product.